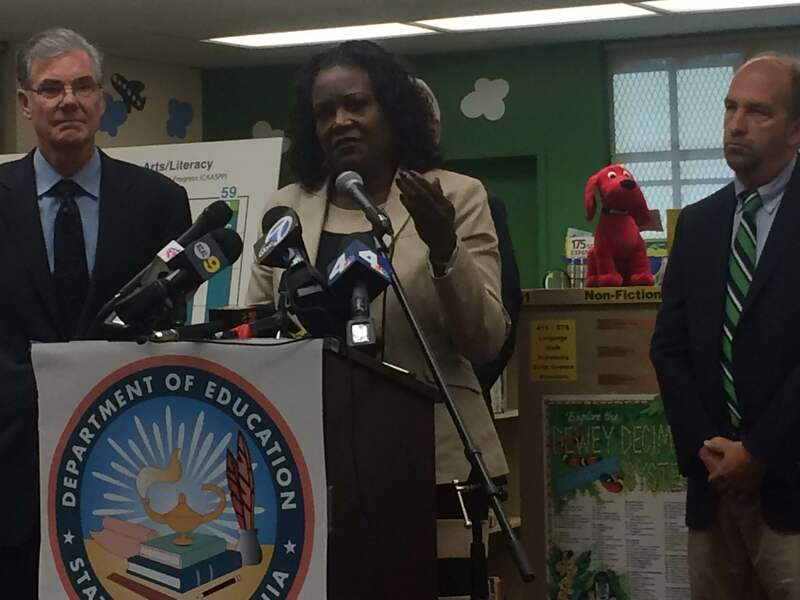 State Superintendent of Instruction Tom Torlakson, left, LA Unified Superintendent Michelle King and LA Unified school board President Steve Zimmer at Eagle Rock Elementary School to discuss new standardized test results. LA Unified Superintendent Michelle King, State Superintendent of Public Instruction Tom Torlakson, LA Unified school board President Steve Zimmer and other leaders called a press conference this morning at Eagle Rock Elementary School to tout the results of the newly released standardized test scores. Scores in the California Assessment of Student Performance and Progress (CAASPP) went up both statewide and districtwide in the second year the Common Core-aligned tests were given. King was quick to point out that LA Unified’s gains were among the best of any large district. “These represent some of the highest gains that were achieved among urban districts in California,” King said. King also pointed out that nearly every important subgroup like English learners and students from economically challenged households also saw gains. Statewide, students jumped five percentage points to 49 percent meeting or exceeding the English standard, while jumping four percentage points to 37 percent who met or exceeded the math standard. Zimmer, who is running for reelection, said he does not put all his faith in test scores but was happy to brag about the results. The board president has received financial support and the endorsement of the LA teachers union, UTLA, which has a policy of downplaying the importance of standardized tests, in particular when they are used to judge the performance of teachers. “Those of you who know me know that I don’t believe that test scores tell us everything. I don’t even believe that test scores always tell us the most important things. But they are an indicator of progress, and the scores that we are releasing today show that in almost every significant area this district continues to make progress,” Zimmer said. Zimmer, King and Torlakson stayed away from some of less positive news from the test results, including that the achievement gaps between some minority groups and white students, and between students from economically challenged backgrounds and their wealthier peers, remained close to the same as last year. While minorities and subgroups showed improvements, so did white students and those not from wealthier backgrounds, so the gaps remained at close to the same levels. “Yes, absolutely, we have a lot of work to do. Yes, unfortunately, we did not see the achievement gap narrow. It’s real and we have to redouble our efforts,” Torlakson said when asked by a reporter about the achievement gap. He then added that he is working to create a team on equity in education to focus on the achievement gap. When it came to the improvements that have occurred, Torlakson said not all the reasons are known, but he did credit the increased education budgets over the last few years from Gov. Jerry Brown as a key factor. “Why did this occur? We don’t have all the answers to that question. There is research and further analysis of data to be done, but I believe that it is because we have set new, higher, rigorous standards, relevant standards to our students, and it is because we have had better budgets, so we have had the resources to make a difference,” Torlakson said.